IE9 beta can be downloaded from beautyoftheweb.com. It’s a cheeky domain name but Microsoft has produced an impressive website. I was certain they’d cheated with a sprinkling of Silverlight, but it’s mostly HTML5 and jQuery loveliness. The 32-bit and 64-bit versions for Windows 7 and Vista are available. If you’re hoping the 64-bit edition would allow you to retain a 32-bit IE8, you’ll be as disappointed — both versions are updated. The file is 2.4MB but additional components are downloaded during the installation process. The full install takes around 15 minutes including a reboot. I still find that slightly ridiculous for a browser, but it’s no worse than previous versions. 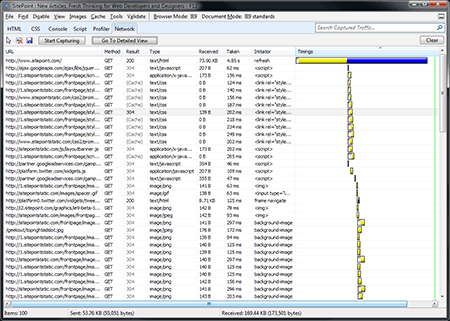 There are no real surprises; IE9’s interface matches the leaked screenshot. We all scrutinized that image even though 33% of SitePoint poll respondents considered it to be a fake! The single main toolbar contains back, next, the address bar (with compatibility view, refresh, and stop icons), tabs, home, favorites, and tools. There isn’t much space for the tabs and they shrink rapidly. You can resize the address bar, but I’m surprised Microsoft didn’t use the empty title bar space. Page titles are never displayed so I suspect tabs could move up in a future beta. The tool options are logical although I’d question the ordering. Should ‘Print’ appear at the top? Perhaps it’s because Microsoft want to show off IE’s printing facilities — they’re far superior to all other browsers. Unfortunately, IE9 retains the thoroughly confusing Internet Options dialog. There’s too much jargon, unusual choices, and little help for novices. Power users will also struggle with strange omissions, e.g. Notepad remains the default HTML editor and it’s not possible to start IE with previously opened tabs. As you’d expect, Windows 7 integration is excellent and IE9 takes full advantage of taskbar features such as aero peek and jump lists. It works well, although I would have liked to see previews when hovering over tiny tabs. The Quick Tabs screen has also disappeared? Overall, the default interface is clean, unobtrusive, and obviously influenced by Chrome. There are a few niggles such as the cropped back button and reduced tab space but it’s a vast improvement on IE7/8. If I could have one final nitpick, it’s the logo. What were Microsoft thinking? It’s never been particularly imaginative, but the new toy-town version isn’t any better! IE9 is fast. Seriously fast. 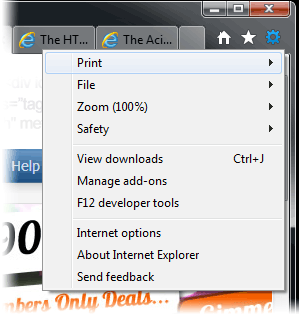 If speed was the only reason you switched to Chrome, IE9 will soon become your default browser. A cold start takes 2 or 3 seconds at most. Following that, opening and closing IE is instantaneous and the browser always feels responsive. Page rendering is quick and DirectX is evident when viewing videos or fast animations. I suspect Microsoft are using pre-caching memory-hogging jiggery-pokery. Additionally, IE9 doesn’t restore previously opened tabs which reduces start times further. Few users will care — they will simply appreciate IE9’s speed and responsiveness. Like Chrome, each IE9 tab runs as a separate Windows process and typically uses between 6 and 60MB depending on the content. Chrome appears to use slightly less memory per tab but launches more processes, so they’re roughly comparable. Stability is good for a beta product — I did experience a crash and a few one-off page load failures, but the browser tabs remained open. Concatenation operators in IE9 are faster than IE8, but array joins are significantly worse — around 10 times slower. And why is the 32-bit IE9 twice as fast as the 64-bit edition on a 64-bit OS? I’m yet to encounter significant layout issues during my limited time with the browser. 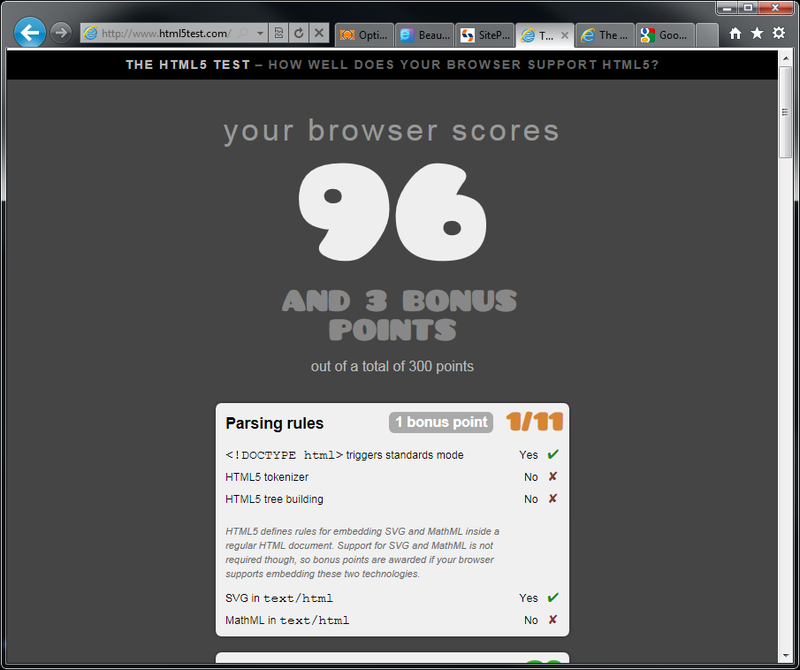 IE9 hasn’t thrown any surprises and rendering is as good or better than I expected. HTML5 has finally arrived. 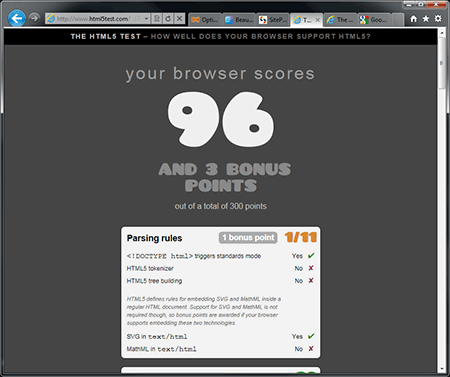 IE9 beta scores a fairly low 96/300 at html5test.com but many important facilities are available including most new tags, audio, video, SVG, and canvas. The browser is missing features such as HTML5 input types, geolocation, and drag and drop so we can only hope Microsoft choose to add support in a future build. CSS3 is a little patchy, but new selectors and media queries are well supported as are more frequently-used properties such as multiple backgrounds, box-shadow, border-radius, opacity, rgba and hsla. 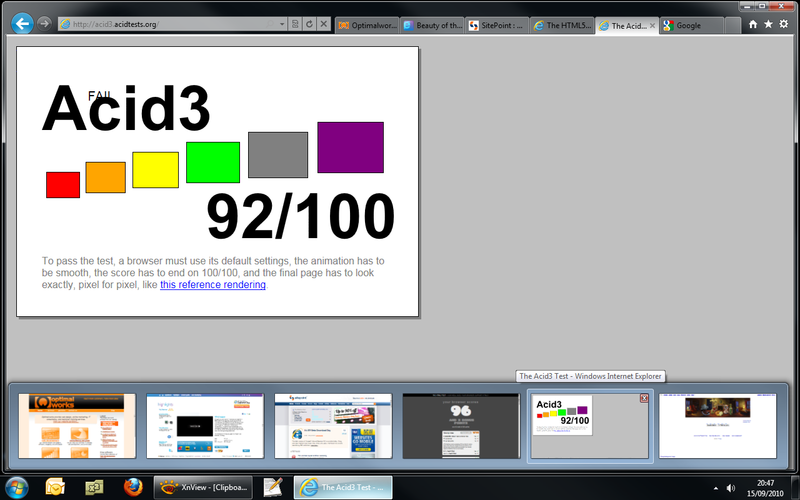 IE9 scores 92/100 in the ACID3 test — lower than it’s competitors but significantly better than IE8. It’s a welcome addition, but it’s clunky and less usable than Firebug’s Net tab or Webkit’s Developer Tools Resources panel. 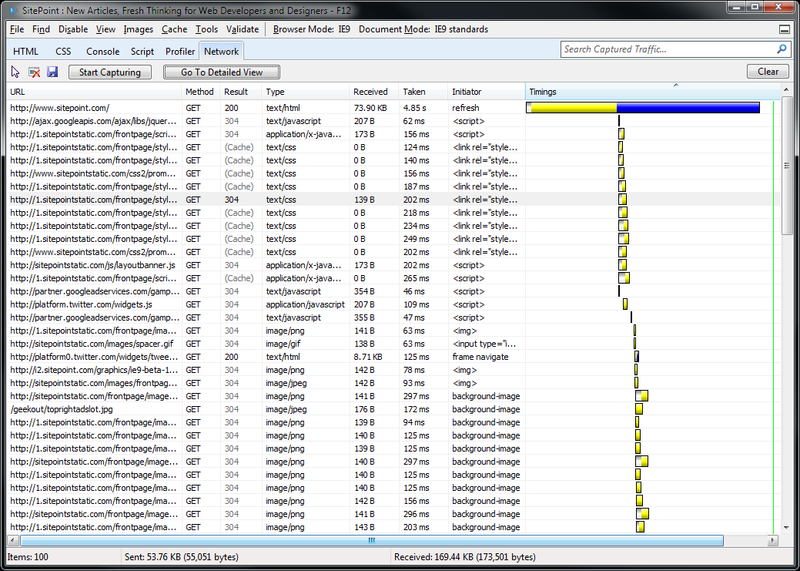 IE’s Developer Tools have always felt like a rushed component bolted onto the browser a few minutes before release. It’s useful, but the interface requires a design and usability overhaul. I’d have expected more from the company which produces Visual Studio. It’s early days for IE9, but it’s already apparent that the browser has taken a giant step beyond its predecessors. IE8 fans will still recognize their browser and some previously disaffected users will return. The simpler interface and amazing speed are the key improvements — I will certainly use it for fast-browsing situations, perhaps in preference to Opera or Chrome. That said, IE9 isn’t perfect; the interface requires tweaking and many HTML5 features are missing. The lack of XP support and sedate update schedule is also worrying. The IE team have much work to do before the final release, but the IE9 beta is impressive. Microsoft is back in the browser game. Do you like IE9? Please leave your comments below or cast your vote on the SitePoint poll.